Edited: The links I previously shared to the making friends website are no longer available. 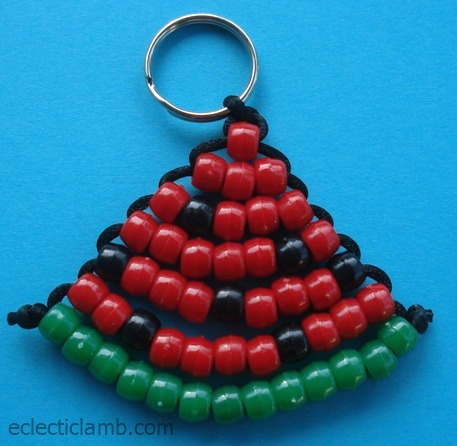 I now link to a watermelon pattern on another site. For the Smile Face and Ladybug, you should still be able to make these projects using my images and new links provided if you have some patience and knowledge of making pony bead projects. For other patterns go here. Awhile ago I asked my nieces and nephews if they had an idea of a craft we could do together for my blog. My 11 year old nephew remarked that he would like to make something with pony beads. For his last birthday he asked for pony beads and we gave him some. 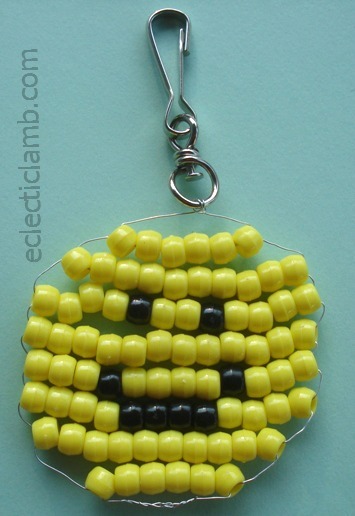 This was my first time working with pony beads that I remember. When we started the project I just watched him string on the beads (somewhat boring for me). Eventually we figured out that it was easier when we worked together to pull the strings/wire and to have my hand on the already completed lines of beads. 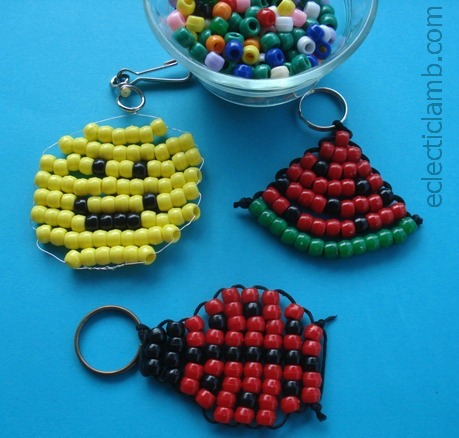 These three projects are very easy, there are no additional loops, just straight lines. I enjoyed spending time with my nephew while working on these projects. In the future I would like to work on advanced pony bead projects with him. Watermelon: We used a pattern from makingfriends.com. Edited: the pattern is no longer available on the Making Friends site. A similar pattern is found here. Smiley Face: We used this pattern from makingfriends.com. We first tried it with cording but switched to wire which gave the design more support. Edited: the pattern is no longer available on the Making Friends site. A similar pattern image is found here. The link it directs to is the same I had so the link does not work. Ladybug: We used this pattern from makingfriends.com. Edited: the pattern is no longer available on the Making Friends site. A similar pattern image is found here. The link it directs to is the same I had so the link does not work. 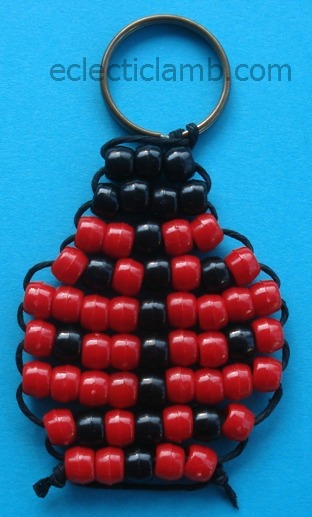 This entry was posted in Crafts and tagged ladybug, pony beads, smile, watermelon. Bookmark the permalink. How lovely! You should sell them at a crafts fair! 🙂 They make great pendants too! The Making Friends website is a Girl Guide site with information on Girl Guide activities, badges, etc., no pony bead templates. Thank you so much for letting me know! The website appears to have removed the patterns. I edited my post to include links when available and images of the patterns.